All my images are available for sale and in any format you want – from un-mounted prints to digital image files that can be used for billboards. For convenience I only show two standard size options (A4 and A3) which are available either un-mounted or mounted. For everything else, just contact me for more information. Here are examples of some of the products available. These make an ideal gift for friends or relatives. They are easy to post and you can have them framed to suit your décor. A4 - the image is about 10"x7" (255x170mm) on A4 size paper (297x210mm). A3 - the image is about 15"x10” (380x240mm) on A3 size paper (420x297mm). For all print sizes there will be a white margin around the image to allow for mounting. Please note that the width of the images is as stated but the height may vary depending on the aspect ratio (i.e. depending on how the image has been cropped). Prints are usually on Fuji Crystal Archive or Epson Premium Lustre Professional Digital paper or equivalent. The finish for both papers is lustre/semi-gloss. Photographs are rolled in acid-free tissue paper and placed in a sturdy cardboard tube for posting. The prices are £20 for A4 and £25 for A3, plus £5 per tube postage & packing for first class Royal Mail postage to mainland UK (signed for). Additional photographs (up to a maximum of 3) will be supplied in the same tube. If you require a quote for postage rates to other parts of the world, please ask. As above, but with ph-neutral white-core mountboard and backing board, ready for framing. I normally use a lightly textured off-white mount board (sometimes called Snow White). A4 prints are supplied in a 14x12" mount. A3 prints are supplied in a 20x16" mount. Prices from £35 plus £5 P&P. Only available by post as an un-mounted print due to the size - these will be supplied in a tube. The prints are usually 32" wide with a 1" white border, so the actual image is about 30" wide. The image height will vary by image. They are designed to go into a frame that is about 36" wide. 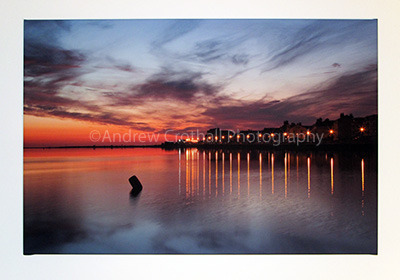 I can also supply panoramas mounted or framed for local delivery. Prices from £40 plus P&P. I can supply framed pictures in any size or style to suit your home or business. You can choose from an extensive range of quality wooden mouldings (including the Arqadia range). Unfortunately, it is too risky to send framed glass pictures in the post, so these can only be delivered locally to the Wirral and surrounding areas. Prices from £65. Live on the Wirral? 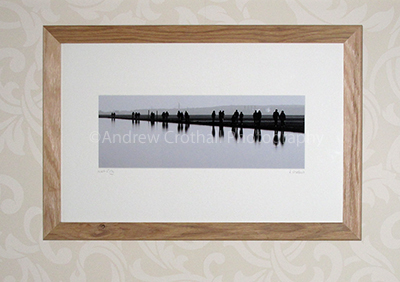 - then take a look at my framed pictures in the Wro Lounge in West Kirby (http://thewro-lounge.co.uk/). Available in either standard or premium quality, this is an excellent way to display large images and works well in a modern décor style. Standard canvas prints are printed on 340gm polycotton canvas on a 28mm pine frame and are available in sizes up to 20”x30”. The premium product is on heavier gauge cotton canvas and frame, is heat-sealed for protection and ease of cleaning and is available in sizes up to 40”x60”. Floating canvas frames, MDF blocks, box frames, aluminium panels – just ask! My range of Limited Edition prints is available via Artfinder, who deal exclusively in original and limited edition artworks. How about your choice of image covering an entire wall? This is now available as either conventional paper wallpaper or as self-adhesive vinyl. Price depends on the area you need to cover. Please ask for details. I can supply high-quality digital images for editorial and advertising purposes. I have supplied images for magazines, museums, banners and billboards. My rates are dependent on the intended usage, but will be cheaper than image agency fees. Please contact me for a quote. I accept credit and debit card payments via PayPal. You will automatically be taken to the PayPal payments page when you click 'Place Order' from your shopping cart. To order a print, click on the image in the gallery, then click the 'add to cart' button. When finished, click 'view cart' or go to the Shopping Cart section, review your order and then click 'Place order'. Don't worry if you don't have a PayPal account - it doesn't matter, you can still use your credit or debit card. When you get to the PayPal page, just click on the link next to the 'Don't have a PayPal account?' section. If you would prefer to pay by cheque, don't use the shopping cart feature - instead just send me an email using the 'Contact Me' page and include the reference numbers of the images you want. When you place your order in this way, I will respond by email and provide the address for you to send your cheque to. 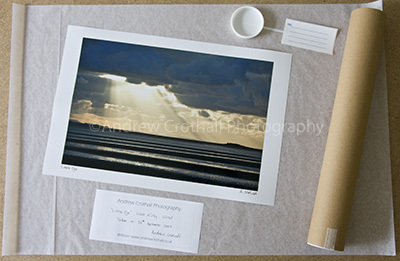 As most images will be printed when you place an order, please allow up to 2 weeks for delivery. It is usually possible to achieve a faster turnaround – just let me know if you are in a rush!